Hey, kidlit friends! The WriteOnCon team is growing! 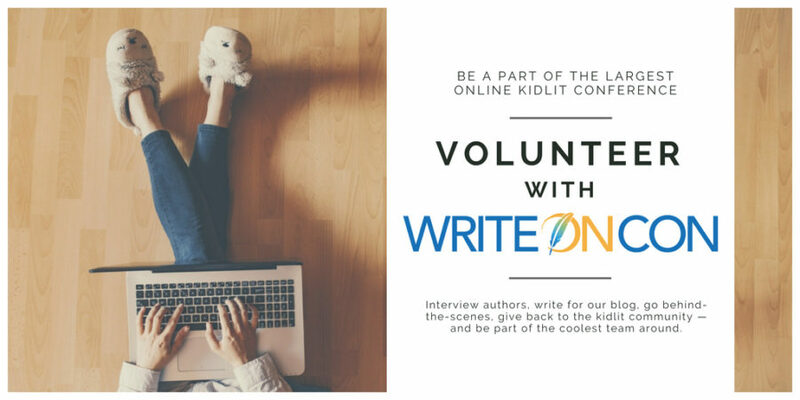 We’re looking for enthusiastic and dedicated people to join our group as we plan for WriteOnCon 2019. You are welcome to apply for any/all positions that sound of interest to you. Time-frame: Planning begins mid-August and continues till after the conference in mid-February.Hours: Dependent on position, but averages 5-10 hours a week. See job descriptions below.Wage: Yes, the lead positions are paid! Compensation is dependent on how much the conference collects in admissions, as team members receive a percentage of that amount. However, it’s likely to be between $4-6 (USD) per hour, based on previous years. For volunteers, we like to send a gift after the conference. Live Event Coordinator (paid): This person will coordinate the live events and will work with our speakers to ensure they’re prepared and ready to go for their events. It will also include coordinating event moderators and overseeing the events on the conference weekend to make sure things go smoothly. Most of the work for this will be after Christmas, and will probably be about 5 hours a week plus the full conference weekend.Event Hosts (volunteer): These hosts will be responsible for ensuring speakers are set up and ready to go and feeding speakers questions during their events. Almost all responsibilities will fall the week before and during the conference window (about 2 hours per session). Hours are flexible and distributed according to your preferences. Podcast Coordinator (paid): This person will be organizing and overseeing the recording of our podcast interviews. It will involve scheduling interviews with speakers, ensuring questions are prepared for the interviews, and conducting the interviews or delegating with other interviewers as necessary. This person will also be responsible for making sure transcripts are completed after the interviews are done. This will be ongoing through fall and winter. 5-10 hours per week.Podcast Interviewers (volunteer): These interviewers are responsible for individual interviews, taken on a volunteer basis. Interviewers will work with the speakers and the coordinator to arrange a schedule. They will also help the main coordinator prepare interview questions. During a call, the interviewer will record their conversation with the speaker (about 30 minutes). After the interview, if possible, the interviewer will be responsible for transcribing the interview. 2-5 hours per session taken. Lead Writer (paid): This person will be in charge of our weekly newsletter and blog posts. They will also help create and/or modify posts pertaining to conference instructions and announcements. Hours are probably about 2 hours a week during the fall, 4-5 hours a week after Christmas.Blog Formatters (volunteer): After January, as our speakers begin to turn in their blog/vlog and podcast entries, blog formatters are responsible for preparing the entries on WordPress, proofreading the text, and ensuring that the formatting is correct. Some HTML experience preferred, but it is not a requirement. Formatters will be given training by our lead web coordinator. Forum and Critique Partner Search Manager (paid): We are adding a new feature to the website this year! This person’s job will be to research WordPress plugins for it and get things set up on the website with the help of our Website Lead team member. Also to be the primary troubleshooter if there are problems, and enforcer if people are using the service inappropriately. This person will also be in charge of organizing and managing the forums. Hours will probably be 5-10 per week in the fall and likely about 5 hours a week after Christmas. Help Desk Representative (paid): This person will be responsible for monitoring our customer support email account and responding to basic inquiries. Hours will be variable; likely 1-2 a week in the fall, rising after Christmas, and potentially 10+ during the conference window.